Paraloid B 72 in Ethyl Acetate, 25 % | Synthetic Resins | Solvent-soluble Binders | Mediums, Binders & Glues | Kremer Pigments Inc.
Can be used as reversible surface for labelling museum objects. 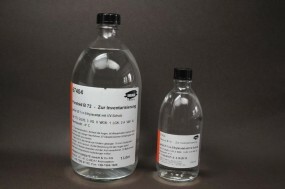 Paraloid B-72 is an excellent general purpose acrylic resin. It can be applied in either clear or pigmented coatings by a variety of application methods. Chemical description This is a preparation with UV protection. Customer evaluation for "Paraloid B 72 in Ethyl Acetate, 25 %"